Sometimes we find some of the most interesting places along the NC Coast when we aren’t even trying! Dale Varnam’s 28-acre Fort Apache in Supply NC is one of those places that you stumble upon in wide eyed wonder that brings to mind the old saying that “one man’s junk is another man’s treasure”. He likes to call it a” Contemporary Art Museum”. Driving down the old Stone Chimney Road heading towards Holden Beach, you will come upon an open toilet with a couple of legs legs protruding from it. Even before you enter the premises through the front gate you will encounter stuffed dummies sitting in police cars while an enormous bus called the Crack Head Express warns passing drivers of the perils of drugs and to “stay off the rock.” Several cowboy-like figures hang from nooses. This odd spectacle is just one part of a huge collection of random junk and artwork that comprise this 28 acre spread named Fort Apache. Much of the material comes from regional film and theater work. Back in 1957, Varnam’s father, Olaf, started a junk yard and scrap metal repository just up the Lockwood’s Folly river from their family homestead of Varnamtown. Over the ensuing years it has metamorphosized into a stockpile of American memorabilia and oddities that are stuffed, hung, parked and placed in every available space. Varnam can’t remember exactly why he named it Fort Apache, and it has drawn stares from people driving down Stone Chimney Road through Brunswick County for years. “I guess I’d just call it art,” says 66-year-old Dale Varnam the owner of this odd roadside attraction. Varnam collects the props from movie and theatrical sets, and puts them out for people to look at. But Varnam said he also wants to make people think. Varnam’s past is also well-known in the area as he was caught up in a federal drug raid that made headlines in the 80’s known as “Operation White Tide” . That part of his life started when Dale graduated Shallotte High School in 1971 and fell in love with money. He the found the best way to gain loads of it was trafficking in drugs. He didn’t cared whether the cocaine he was unloading was pure or not as long as the money was. In 1988, Varnam avoided prison time on three dozen cocaine trafficking charges after helping investigators indict 70 others in the wide-reaching sting. Four years later, though, he was sentenced to 35 years after pleading guilty to several breaking and entering charges. Varnam left prison in 2001, and became “saved and baptized,” and soon was dedicating himself to creating his unique version of a “theme park”. Varnam and his cornucopia of the bizarre has been the location for a movie “Don’t Know Yet”, the subject of a documentary “Another Man’s Treasure”, and an episode after of the television series when back in 2011 The History Channel’s “American Pickers” spent a day indulging their curiosity. “They called two days before they came to tell me they were coming,” Dale said. The cast and crew of “American Pickers” arrived in Brunswick County and spent more than 10 hours digging on Dale’s property. “So many people had told them they had seen my stuff and told them they needed to check it out,” Dale said. In the summertime his business attracts a lot of attention from out of town and out-of-state guests who drop in to see what his displays are all about and to hunt treasures. Dale said he did sell them some items but the thing they wanted most he wasn’t ready to part with. They bought a few signs, flight jackets and little cars. Dale said he was pretty sure they bought things that won’t air simply because there is so much to look at. 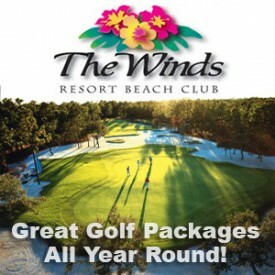 This May stay at the area’s premier oceanfront resort and play top area courses for $142 per golfer all inclusive! Sea Turtle Camp is a summer camp for children ages 10 to 17 that is immersive in marine biology with a mission to cultivate love and respect for the ocean located in Wilmington, North Carolina. Sea Turtle Camp was founded to offer youth the opportunity to learn about marine biology through immersive, hands-on, feet-wet experiential education. Their mission is to cultivate a love and respect for the ocean by building confidence and developing character, while inspiring coastal conservation through safety, fun, and learning! Sea turtles are one of the oldest living creatures in the world, but their numbers are being depleted faster than they can reproduce. While all the world’s problems can’t be solved by a camp, they know that one person can make a difference, and a camp full of eager knowledge-hungry young people can make a huge difference. One of their goals is to share their passion for life and teach young adults how to mold that passion into a selfless, hard working team of individuals that can recognize problems and work towards solving them. Through a grassroots approach, they strive to show campers a wide variety of possibilities at a time in their life where they have many potential roads to follow. In doing so they will learn the rewards of selflessly giving their time and energy to their communities, encouraging volunteer service and potentially impacting their career paths. Ultimately, the goal of founders, Jen Civelli and Jean Beasley is to raise compassionate awareness and pour support into our life sustaining oceans. The Karen Beasley Sea Turtle Rescue and Rehabilitation Center is a place where many volunteers share their love and give their time to care for just one aspect of our oceans that many people take for granted. The Sea Turtle Camp fill up quickly so those that are interested should go ahead and enroll as soon as possible! The Full Sea Turtle Camp Schedules & More Information Can Be Found By Visiting Their Website Here! Start your day with a sunrise and end it with a glorious sunset. this is one of the unique features of life in North Carolina’s Brunswick Islands with 45 miles of south facing beaches that will allow you to experience both. Between time you can fill your day with endless of activities like golfing, boating, fishing, shopping and dining. Sharpen your game at 35 courses that have earned this area the nickname, North Carolina’s Golf Coast. Plan a romantic getaway package or even a wedding on one of these beautiful island beaches. Or you can just spend a special day with your kids at Holden Beach, named best for families by Dr. Beach in 2012. Imagine a day spent browsing through the specialty shops, teeing off at one of the many nearby championship golf courses or launching your boat for a day at sea. Follow this up with a great meal at one of the many fine restaurants in the area, or by picnicking on your deck while watching the waves roll in. Visit The Sunset Beach Vacation Planning Guide Here! SunsetNC.com is a site dedicated to Vacation Planning and Coastal Living. 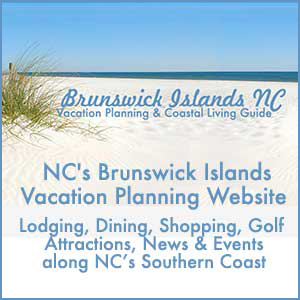 Find information on Sunset Beach, NC Hotels, Resorts, Rental Cottages, Restaurants, Golf, Real Estate and much more. Sunset Beach NC has been named as “One of Best Beaches in the World” by National Geographic! Ocean Isle Beach lies between the historic port of Wilmington, N.C. and the tourist attractions of Myrtle Beach, S.C. Although Ocean Isle Beach has grown and developed over the years, it has maintained its relaxed and leisurely charm. 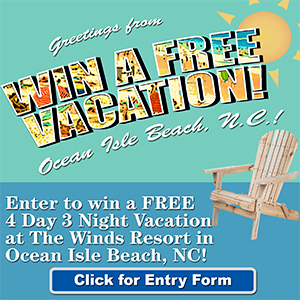 OceanIsleBeach.com is a site dedicated to Vacation Planning and Coastal Living. Find information on Ocean Isle Beach, NC Hotels, Resorts, Rental Cottages, Restaurants, Golf, Real Estate and much more. The largest of the South Brunswick Islands, Holden Beach North Carolina stretches eleven miles along the mainland and consists primarily of private and vacation rental homes and condominiums. Holden Beach NC is a wonderful place for families and couples to experience a fun and tranquil beach vacation while being just minutes from numerous golf courses, restaurants, shops and amusements. The island has an excellent full-service fishing pier and is well known for its incredible off-shore and surf fishing. In march the Greater Holden Beach Merchants Association holds the “A Day at the Docks” festival; and in October, they sponsor the Festival by the Sea. Both events are full of food, fun and entertainment for the entire family. Holden Beach is a magical place where you will experience unforgettable days filled with white sandy beaches, sea shell hunts and complete relaxation. HoldenBeachNC.com is a site dedicated to Vacation Planning and Coastal Living. Find information on Holden Beach, NC Hotels, Resorts, Rental Cottages, Restaurants, Golf, Real Estate and much more. Oak Island stretches along the coastline of Southeastern North Carolina. Oak Island is a family oriented beach with entertainment for children as well as adults. The town features more than 52 public beach accesses, two fishing piers, a marina, public boat/canoe ramps, picnic areas, bike paths and an extensive sidewalk system. Oak Island offers a championship golf course, the highest fishing pier in North Carolina, miniature golf, a picnic area, an arcade and nine beach accesses. There are also many small retail stores for shopping, restaurants, a medical facility, a church and library. Oak-IslandNC.com is a site dedicated to Vacation Planning and Coastal Living. Find information on Oak Island, NC Hotels, Resorts, Rental Cottages, Restaurants, Golf, Real Estate and much more. The first thing that you will notice about Bald Head Island is the natural beauty that surrounds you. From the quiet unspoiled beaches to the maritime forests this is a truly exceptional place. A site dedicated to Vacation Planning and Coastal Living. Find information on Bald Head Island, NC Hotels, Resorts, Rental Cottages, Restaurants, Golf, Real Estate and much more.